This issue marks the start of Volume 4 of the Shape Shift Report - our 4th Influence Issue. How time flies, right? Going back through the archives, of The Influence Issues specifically, a few things stuck out to me: 1) In 2014, we were still unsure of the impact of influencers and where influencer marketing was headed. 2) User-generated content and review-based marketing has grown exponentially. And 3) Brands are still figuring out ways to measure ROI when it comes to bloggers and influencers. All said and done, we're still talking about influence and influencers in marketing. There's still more to be explored. In this issue we share insight on the brands built from influence, the need for transparency in the industry, as well as a look at Matte Black's newest content product built from the micro-influencer: Candid. "Some loved me, some hated me. but they all followed me." Lately it seems like the most buzzed-about brands are those backed by faces with an impressive following. This begs the question, does who you are matter more than more than what you make? If one thing is true of influencer marketing today, it's that there is no shortage of people willing to help promote and sell your brand. So, what sets a good influencer apart from a bad influencer? Transparency. Over the past four years, it seems that influencer marketing has changed quicker than we can keep up. What started with the hobby of blogging has since catapulted into a billion dollar business and an industry that brands are still trying to find their place in. This article shares Matte Black's own experience with influencer marketing and how it transitioned into their newest content product: Candid. "Top Shelfies" are one of the most favored content categories for today's fashion, beauty and lifestyle blogger. Something about the way expensive beauty products look in a medicine cabinet translates to high engagement rates on Instagram. 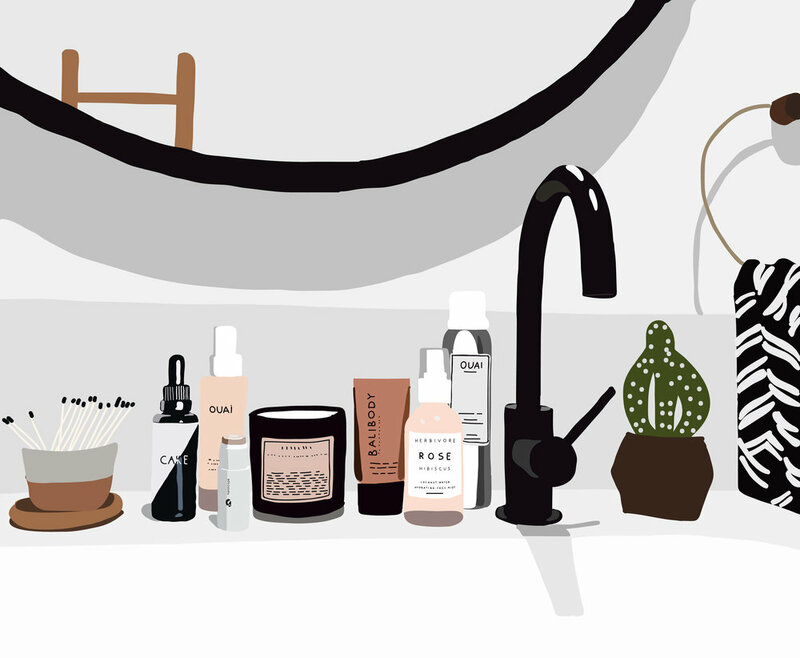 Paris-based illustrator Marine de Quéntain quickly realized the popularity of the Top Shelf content and has now built a business on recreating them through her illustrations. She's since worked with brands like Glossier, Goop, LMHV and Sephora. In last year's Influence Issue, we put together a list of the Top 40 Micro-Influencers of 2016. This year it's bigger and better! With the help of PeopleMap, we put together our Top 100 Micro-Influencers and Content Creators that we think you should work with on your upcoming projects. SHHHOWERCAP is putting the beauty basic back on the map in a way we haven't seen it before. Tune in as we chat with the Founder + Beauty Boss, Jackie De Jesu, about the roots of the brand and her five things to keep top of mind when turning a product from basic to noteworthy. "You are what you share." In 2017, nearly every day I have heard an array of people whisper, cheer, and question how "we are feeling" about the rapid pace at which technology is progressing. There is awe. There is fear. Angst. Excitement. Commentary about the looming death of retail. The anticipated tragic end of all human interaction. People falling in love with robots. Robots stealing our jobs. Our dear planet Earth soon turning into a life-long “Her” movie. Cue the tears. Just last holiday season, Global sales were up 4% and retail was down 1%. Since that data was drawn, over 7,000 retail stores in the US have closed. We have reached a tipping point, so to speak. However, The CEO of eBay doesn't believe that retail will disappear. He provides fascinating insight into what the new customer service model will evolve to become. He talks about the ways AI will be able to recommend purchases, far surpassing the current algorithm which relays "people who bought this also bought this.” It’ll soon be able to draw a profile of what it thinks you’ll like, based on the art you once purchased or the TV shows you regularly watch. All in all, a supremely informative and frankly quite fascinating look into the future of retail. Summer two thousand and seventeen. We leaned into it. In this latest for i-D Magazine, Frank Ocean marries words with visuals that encapsulate his festival journey this past summer. This concept is not unfamiliar to Frank Ocean. Lucky fans were able to get their hands on Boys Don't Cry, the magazine that came with the long-awaited album Blonde. The visual essay paints his summer as a warm and fantastical journey, and features his team who has helped him bring his imagination to life in sound and on stage. Ocean combines intimate, portrait photography, candid moments, and mixed media to showcase the dream-like summer. The 32-page shoot is also paired with a letter penned by Ocean - a stream of consciousness blurb that gives us some perspective on his world. However, in typical Frank Ocean manner, there is an air of mystery to his words that keep us hanging on, waiting for more. The most popular direct-to-consumer brands at the moment have one thing in common: the impressive ability to connect with their consumers. I recently read an article written by Pandora Skyes for Business of Fashion which pointed out something I hadn't heard before: "BFF Marketing." This is the idea that a brand is your best friend, making products designed specifically for you, curating their social media content and email newsletters to fit what's happening in your life, good or bad. Examples of these brands include some of today's most popular direct-to-consumer brands at the moment: Glossier, Realisation Par, and Reformation to name a few. Read more about this approach to direct-to-consumer marketing here. Marine is a freelance illustrator, graphic designer, and art director based in Paris, France. She's well-known on Instagram for recreating bloggers' popular "Top Shelfies" which include a collection of top beauty product displayed in a fashionable way. Her work can be found throughout The Influence Issue. Best way to get inspired: To cook and to share good food while having a great discussion. I also love to go for a walk in the nature. Vanda is a Digital Marketing Specialist with a passion for lifestyle and an eye for detail. She lives minimally and mindfully, with her fiance and their 3-year-old corgi, Bandit. She loves coffee, reading and vegan pizza. Drink of choice: Coffee, of course. Quote to live by: Depth over distance. Ashley is a Los Angeles-based, freelance writer who aims to shine a light on makers and other creatives with thoughtful, mindful, and inspirational approaches. She's contributed to outlets including Racked, The Zoe Report, and Manrepeller. Victory song: "Get Me Bodied" always gets me going. Anything by Beyonce, honestly. Childhood comfort: I'm from Wisconsin, so probably cheese curds, or as we called it, "squeaky cheese." Someone to follow on Instagram: Mmy friend @ameliagiller is an amazing illustrator and animator and I love seeing her posts. I'm also obsessed with local rescue organization @luxepaws for the constant kitten pics. How do you take your coffee? I recently limited caffeine, so right now I'm having herbal chicory coffee with collagen and macadamia nut milk. Ugh, so LA! Spirit animal: I hope to be a cat in my next life. Liz is a Los Angeles-based member of the Matte Black team, focusing on Candid Network. She is a recent art history grad with a passion for abstract expressionism and geeks out over all things interior design and architecture. Guilty pleasure: MTV's Teen Mom, so bad but so good. Something to check off your bucket list: I want to take a hot air balloon ride or skydive one day if I ever get the courage.